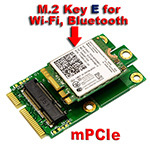 USB M.2 Card to mPCIe adapter. Support 2230/2242 M.2 Card dimension. 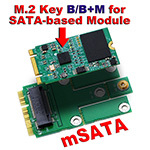 Support M.2 Socket SSIC-based WWAN Module. 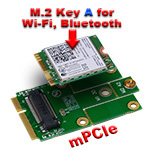 Allows user to use M.2 Socket SSIC-based WWAN Module to mPCIe Slot in the Desktop or Laptop. Supports USB interface of M.2 Cards (Socket 2 SSIC-base WWAN) such as 2G GSM, GPRS, 3G,CDMA, WLAN,WWLAN, HSPA MODEM , GPS, 4G WiMAX, LTE, Mini Card to desktop PC.